The most beautiful set of dice I’ve ever created came from a highly figured English Walnut Crotch Wood (the area where a branch meets the trunk). This wood is highly prized by gunsmiths for gun stocks on their high end shotguns and rifles. One look and you can see why. Figured English Walnut is one of natures true works of art. Wild grain patterns and three-dimensional effects accompanied by the warm rich golden buttery tones interlaced with the typical dark markings of the wood are an unmistakable beauty. 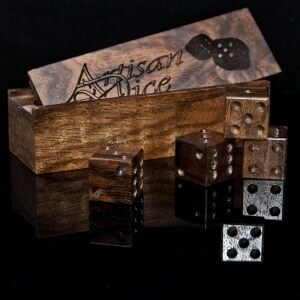 Note: the box is for display only, the dice will come in our standard dice box. I’m interested in a set of English walnut Polyhedrals.The wood looks beautiful, but I wonder how the laser etching will show on a darker wood.Will the numbers be legible? One other thing Charlie (thanks also for the fast reply)How large are the dice if I do the Archdruid Kickstarter for this? that would be becuase the d6 sets are priced incorrectly. they should be more in line with the polyhedral set. I am interested in buying a set of English walnut Polyhedrals. I was wondering, however, why they show up as so much more expensive than the other dice that have the same price range in the other groupings of dice. the d6 prices were incorrect. my apologies. 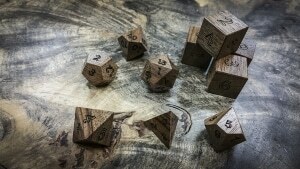 If I were to purchase a 10 polyhedral set could I get pips on the D6s instead of numbers. I prefer the look of pips on my D6s. Also, is it possible to make the D6 the same size as the rest of the dice instead of the bigger size? Thanks in advance. Is it possible to get the box in the same wood (English Walnut) and how much more would that increase the order price? (I am planning on ordering a 10 dice polyhedral set.) Thank you in advance.